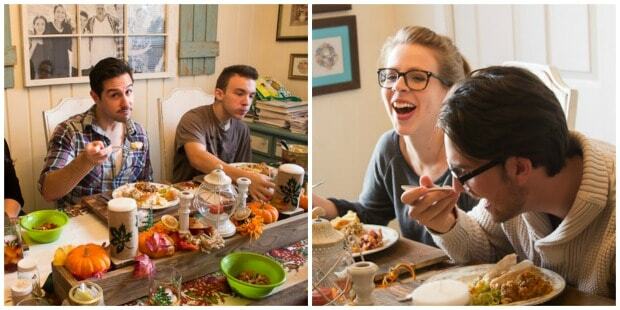 Low Stress Thanksgiving Dinner: 5 Tips to Help You Survive! 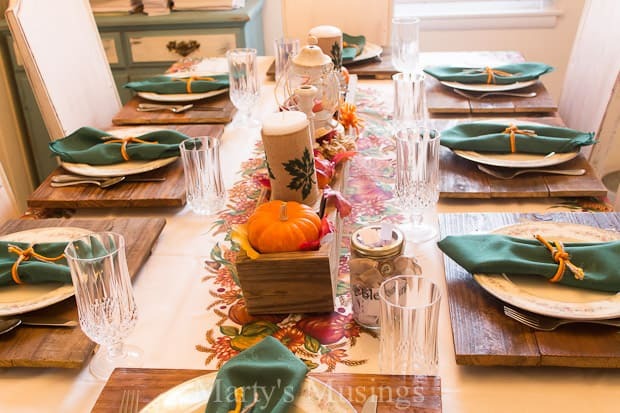 Want to know how to survive the Thanksgiving overwhelm and still enjoy family and friends? 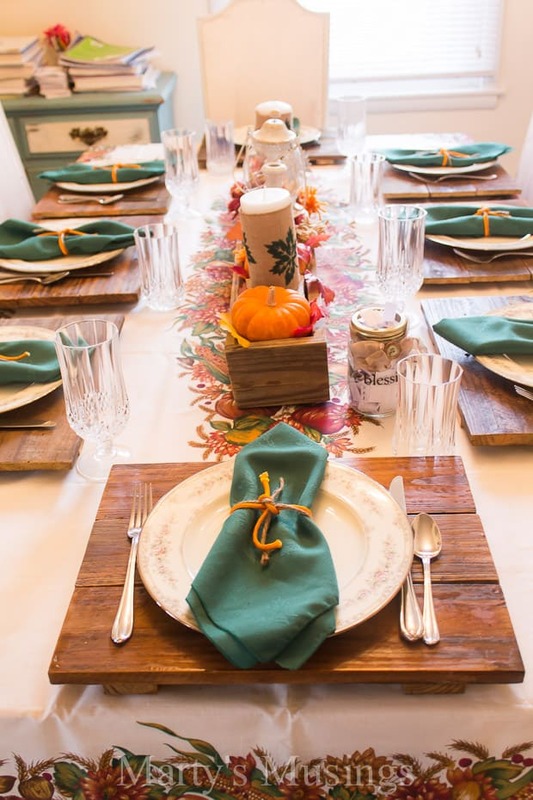 These 5 tips for a low stress Thanksgiving dinner are a must! 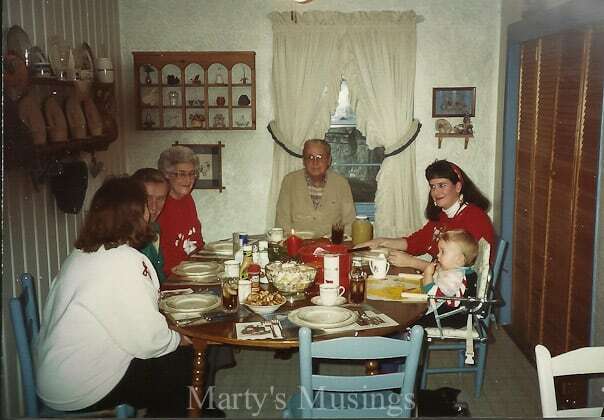 Even before I became a DIY lifestyle blogger I always loved to set a pretty table when company came over for dinner. We were always the first ones to invite the new preacher or staff member from church over for Sunday lunch. For years I also hosted my homeschool moms group for an evening Christmas party. That little boy in the booster seat? He’s now married, working full time and finishing his college degree, the long way. Talk about a reality shock! Now that two of my children are adults with families of their own, I especially want to enjoy both the food and atmosphere when all of us are together. I also want my children to embrace the art of hospitality, which doesn’t mean spending hours on the perfect table but rather making do and concentrating on our guests. 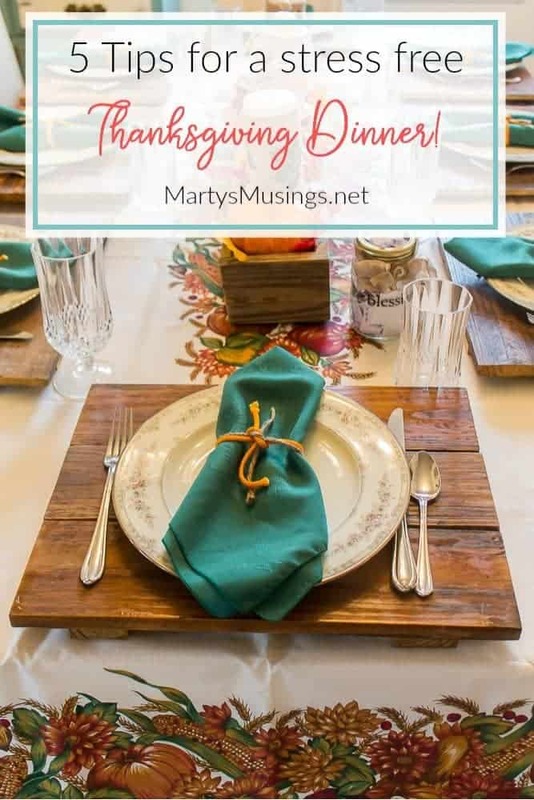 My goal is a stress free Thanksgiving dinner so I can enjoy the precious family gathered around my table. 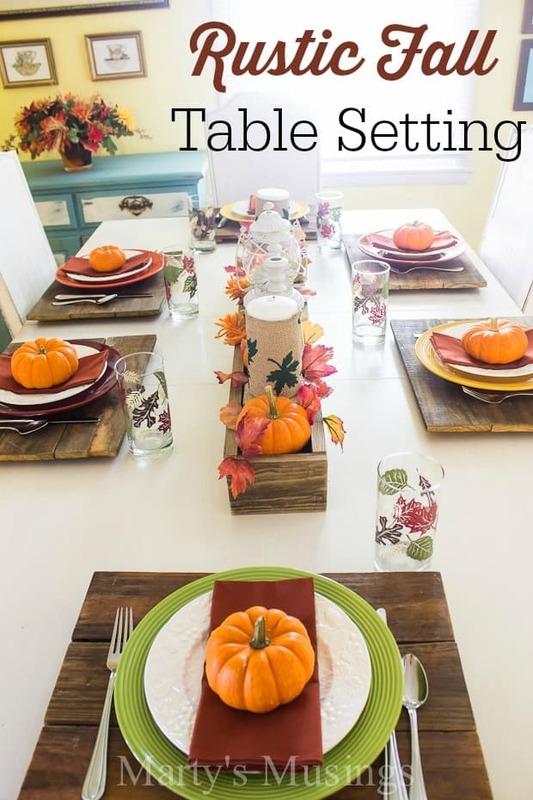 Last year I created a “pretend” fall table just for the blog and a “real” one for my family for Thanksgiving using many of the same items. Here’s the more casual one that I created for the blog (and wrote about here). Here’s the actual one I set for our traditional family Thanksgiving dinner. How do I know it’s for my family? There’s a stack of school books still on the hutch in the background! Let me show you how I created two completely different tables with the same basic elements in a short amount of time. 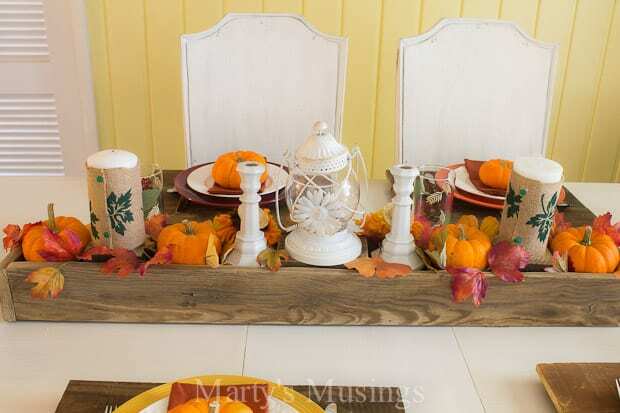 I used the same centerpiece for both tables, a rustic fence board box my DIY hubby built for me. Do you have lots of dinner plates? Or maybe several lace napkins passed down from a family member? Do you love chargers and want one in every color? Maybe you even have your mom’s crystal? 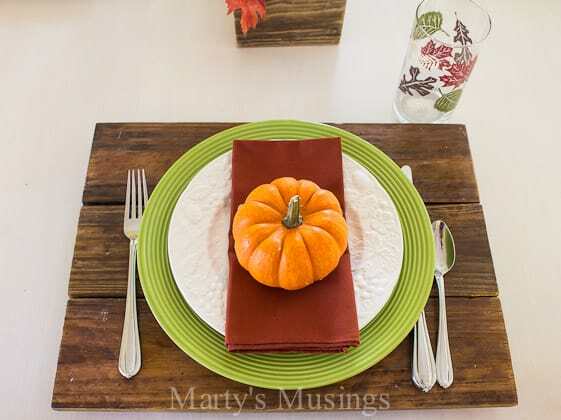 My rustic table setting is a good match with my painted white table. For the family gathering I added a $1 yard sale tablecloth which blends in perfectly with both the rustic and formal elements. Best Tip: Do you have access to natural elements such as flowers, trees or branches? Take a walk in the park and find some elements of nature such as pine cones, berries or branches for a free centerpiece. Today many people view entertaining as a source of unneeded stress. I look at it as a time to reconnect with family and friends, yet try not to put unrealistic expectations on myself, my home or the food. 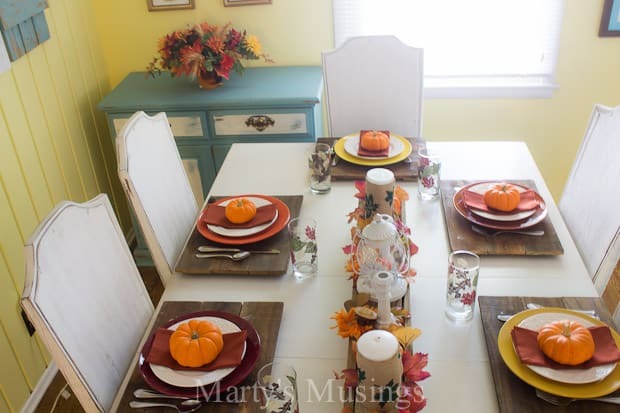 For this casual table I mixed different colored plates from the dollar store with smaller white plates of my own. I also used fall glasses I purchased one year at the dollar store. For the more formal table and our family celebration I used my wedding china and crystal. I just love an excuse to bring out the fancy goodies! 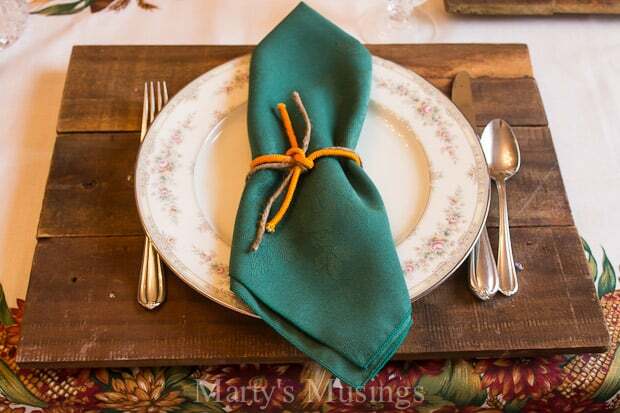 I chose my favorite DIY wooden chargers my hubby made out of fence board for both tables. Dressed up or down, I love their rustic imperfection! Best Tip: Shop your home by mix and matching plates, serving pieces and silverware. 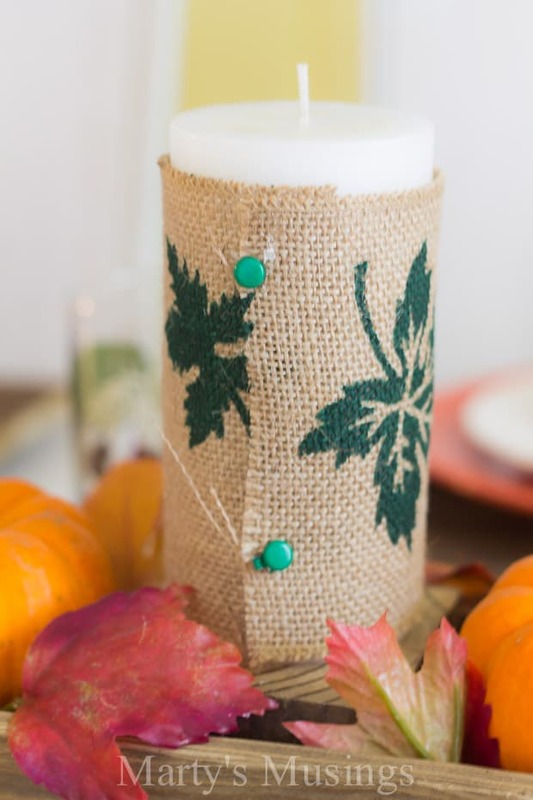 Mix your grandmother’s crystal with wood chargers and burlap. 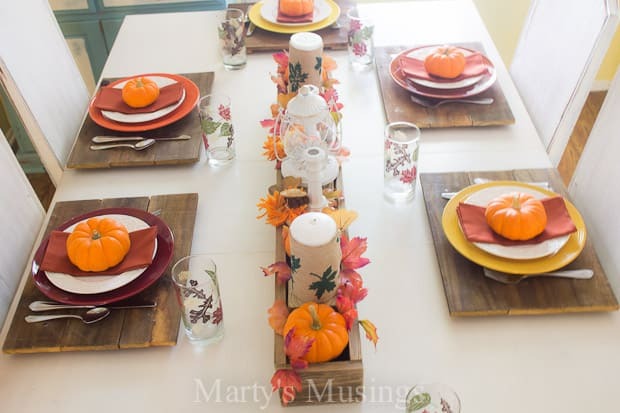 Or use different color plates from the dollar store to match the season. Thankfully, today anything goes as far as styles. Opening your home doesn’t have to mean breaking the bank but maybe just a little creativity with the decorations and menu. If you’re hosting the event, clean your home a few days in advance if possible and just tidy up the night before and do last minute cleaning the morning of your dinner. Best Tip: If you have children and/or a spouse, get them involved in the process. My family always helped and the preparation was just as much a part of the big day as the meal. Families CAN work AND play together! 4. What about the meal? Best Tip: If you have guests coming let them bring something to the gathering. Accept help where it’s offered. Best Tip: Don’t worry if everything isn’t up to magazine standards. Years ago I might have (and did) fret a lot, but in my old age (ha!) I’ve learned that the less stressed I am the more my guests enjoy their time in my home. Enjoy your low stress Thanksgiving dinner! 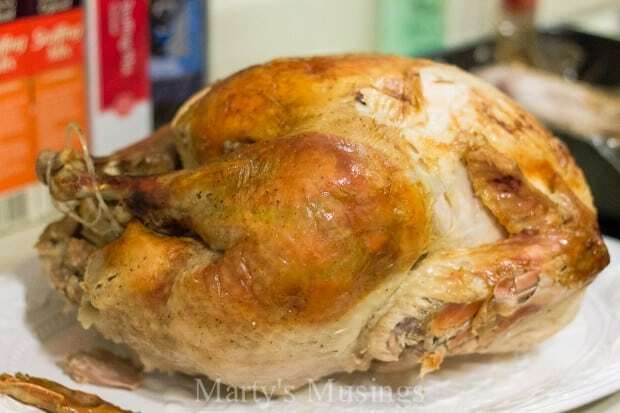 What are your favorite tips for this holiday meal and season?